The analysis also finds that when it comes to using the internet,1 the digital divide between Latinos and whites is smaller than what it had been just a few years ago. Between 2009 and 2012, the share of Latino adults who say they go online at least occasionally increased 14 percentage points, rising from 64% to 78%.2 Among whites, internet use rates also increased, but only by half as much—from 80% in 2009 to 87% in 2012. Among the biggest drivers of these increases are spikes in technology adoption among foreign-born Latinos and Spanish-dominant Latinos, the surveys found. Both groups’ rates of going online and cellphone ownership increased sharply since 2009, helping to reduce the digital divide between Latinos and whites—and also reducing gaps within the Latino community itself. Cellphone ownership: Fully 86% of Latinos say they own a cellphone, a share similar to that of whites (84%) and blacks (90%). Smartphone Ownership: Among adults, Latinos are just as likely as whites or blacks to own a smartphone—49% versus 46% and 50% respectively. Social Networking Site Use: Among internet users, similar shares of Latinos (68%), whites (66%) and blacks (69%) say they use social networking sites like Twitter and Facebook at least occasionally. 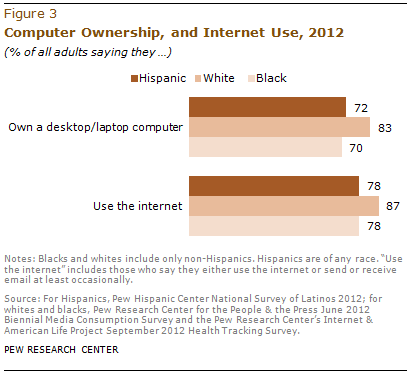 Computer Ownership: Some 72% of Latinos say they own a desktop or laptop computer, compared with 83% of whites. Among blacks, 70% are computer owners. Internet Use: Nearly eight-in-ten (78%) Latino adults go online at least occasionally, compared with 87% of whites and 78% of blacks. Among Latinos, among whites and among blacks, three key demographic characteristics are correlated with technology adoption. Young people ages 18 to 29 have higher adoption rates than those ages 65 and older. Levels of educational attainment are also linked to adoption rates–those with some college experience have higher technology adoption rates than those with less than a high school diploma. And annual family income is correlated with technology adoption–those with higher incomes also have higher adoption rates than those with lower incomes. This report is based on three Pew Research Center surveys. The first survey is the Pew Hispanic Center’s 2012 National Survey of Latinos (NSL). The 2012 NSL is a nationally representative bilingual telephone survey of 1,765 Latino adults with a margin of error of 3.2 percentage points at the 95% confidence level. The survey was fielded from Sept. 7 to Oct. 4, 2012. For a full description of the 2012 NSL’s survey methodology, see Appendix B. The second survey is the Pew Research Center for the People & the Press’ nationally representative Biennial Media Consumption Survey (2012b) of 3,003 adults conducted between May 9 and June 3, 2012. The margin of error for the full sample is plus or minus 2.1 percentage points at the 95% confidence interval. The third survey is the Pew Research Center’s Internet & American Life Project 2012 Health Tracking Survey (Fox and Duggan, 2013). It is a nationally representative sample of 3,014 adults with a margin of error of plus or minus 2.4 percentage points at the 95% confidence interval. Nearly all Hispanics from families with annual incomes of $50,000 or more (95%), Hispanics from families with annual incomes between $30,000 and $50,000 (93%) and Hispanics ages 18 to 29 (93%) say they go online at least occasionally. Just one-third (33%) of Latinos ages 65 and older say they use the internet at least occasionally. Half (50%) of Hispanic internet users are native born and half are foreign born. By contrast, among Hispanics who do not use the internet, just 21% are native born while 79% are foreign born. Among Latino internet users, 72% are either English dominant (31%) or bilingual (41%), and 28% are Spanish dominant. By contrast, among Latino non-internet users, fewer than half (42%) are either English dominant (13%) or bilingual (29%), while 58% are Spanish dominant. Nearly nine-in-ten (87%) Latino internet users ages 18 to 29 and Latino internet users from families with annual incomes of $50,000 or more say they access the internet through a mobile device at least occasionally. Among Hispanic internet users ages 65 and older, just 29% say they access the internet through a mobile device. Cellphone ownership rates are highest among Latinos from families with annual incomes above $50,000 (97%) , Latinos ages 18 to 29 (96%) and Latinos from families with annual incomes between $30,000 and $50,000 (95%). 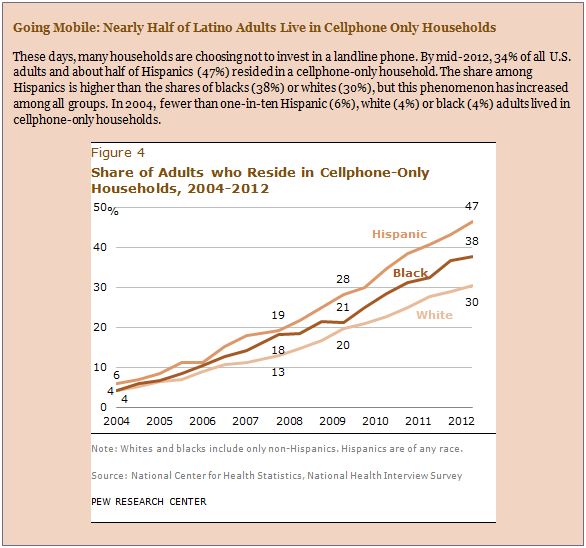 Among Latinos who do not own cellphones, 76% are foreign born and 24% are native born. In addition, nearly six-in-ten (57%) are Spanish dominant, 30% are bilingual and 13% are English dominant. The highest smartphone ownership rates are among Hispanics from families with annual incomes of $50,000 or more (76%). 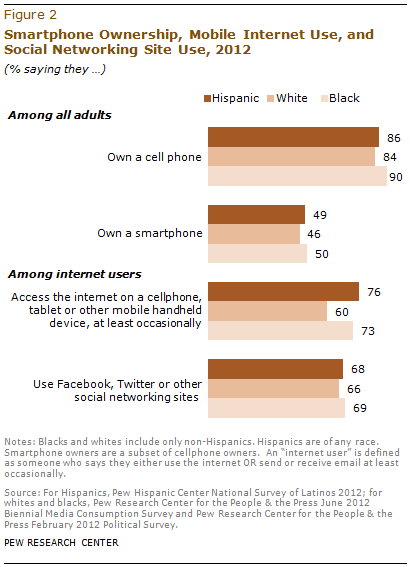 Smartphone ownership rates are lowest among Hispanics ages 65 and older (14%). Most Latino smartphone owners are native born (54%). By contrast, most Latinos who do not own a smartphone are foreign born (58%). Fully 95% of Latinos from families with annual incomes of $50,000 or more own a desktop or laptop computer—the highest ownership rate among Latinos. By contrast, just 35% of Latinos ages 65 and older own a desktop or laptop computer. Half (50%) of Hispanic computer owners are foreign born. By comparison, 73% of Hispanics who do not own a computer are foreign born. Fully 84% of Latino internet users ages 18 to 29 say they use social networking sites such as Facebook and Twitter, the highest rate among Latinos. Just 27% of Hispanic internet users ages 65 and older say they use social networking sites. Some 54% of Latinos who use social media are U.S. born. By contrast, foreign-born Latinos make up the majority (57%) of Latino internet users who do not use social media. Among Latinos who use social networking sites, 60% say they do so mostly or only in English, 29% say they do so mostly or only in Spanish and 11% say they use both English and Spanish equally. Among native-born Latinos who use social networking sites, 86% do so mostly or only in English. By contrast, among immigrant Latinos who use social networking sites, more than half (55%) do so mostly or only in Spanish. This report explores social media, digital technology and mobile technology use among Latinos, whites and blacks in 2012. The data used in this report are derived primarily from the Pew Hispanic Center’s 2012 National Survey of Latinos (NSL), which was conducted from Sept. 7 through Oct. 4, 2012, in all 50 states and the District of Columbia among a randomly selected, nationally representative sample of 1,765 Latino adults. The survey was conducted in both English and Spanish on cellular as well as landline telephones. The margin of error for the full sample is plus or minus 3.2 percentage points. Interviews were conducted for the Pew Hispanic Center by Social Science Research Solutions (SSRS). The report also utilizes data from the Pew Research Center for the People & the Press’ Biennial Media Consumption Survey (2012b), which was conducted between May 9 and June 3, 2012, among a nationally representative sample of 3,003 adults, including 2,202 whites and 281 blacks. It also utilizes data from the Pew Research Center’s Internet & American Life Project’s Health Tracking Survey (Fox and Duggan, 2013), which was conducted between Aug. 7 and Sept. 6, 2012, among a nationally representative sample of 3,014 adults, including 1,864 whites and 497 blacks. This report was written by Associate Director Mark Hugo Lopez, Research Associate Ana Gonzalez-Barrera and Research Assistant Eileen Patten. Paul Taylor, Scott Keeter, Leah Christian, Michael Dimock, Gretchen Livingston, Lee Rainie and Aaron Smith provided editorial guidance. The author thanks Taylor, Keeter, Christian, Livingston, Patten, Rakesh Kochhar, Rich Morin, Seth Motel, Kim Parker and Antonio Rodriguez for guidance on the development of the survey instrument. Motel also provided research assistance. Livingston and Patten number-checked the report. Molly Rohal was the copy editor.